The first Minot State University Presidential Speaker Series guest Elizabeth Smart spoke to a packed house at Minot State’s Ann Nicole Nelson Hall on Wednesday, April 17. Minot State would like to thank Elizabeth for sharing her message with MSU and the greater Minot community. 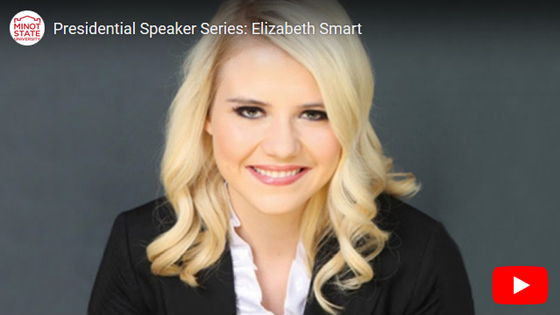 A copy of Elizabeth Smart's lecture will be available for one month. No use of this broadcast or reproduction is allowed without written consent from the Harry Walker Agency and Minot State University.